Alyssabeths Vintage: It's almost Garden Party Time! It's almost Garden Party Time! It's a beautiful day here in N. Texas, soon it will be Garden Party Time! I am currently running a SALE, buy two pieces of jewelry and you get a third FREE of equal or lesser value of the least expensive item! 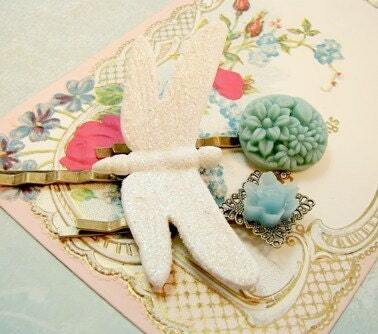 Inspired by the clear blue skies of Summer, Feminine, vintage style set of Hair Pins or Bobby Pins. Handcrafted with a large white glitter Dragonfly, blue floral bouquet & lotus flower resin cabochons, all three are set on lacey antiqued brass filigree. Hair pins measure 2” in length, including the diamond shaped lace filigree. The dragonfly measures a little over 2” across. 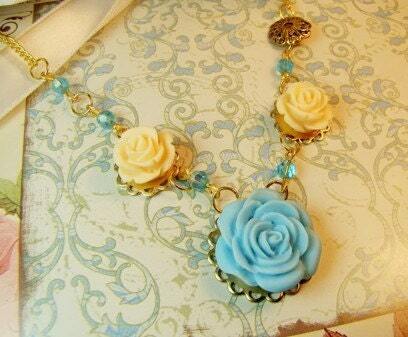 Soft & sweet, handcrafted Spring Garden inspired necklace created with Rose cabochons in pastel sky blue & vanilla cream, accents of tiny aquamarine blue round faceted glass beads, one ornate gold plated filigree charm and strung on a 14K gold plated chain. Each resin flower cabochon is set on a shiny brass lace setting. 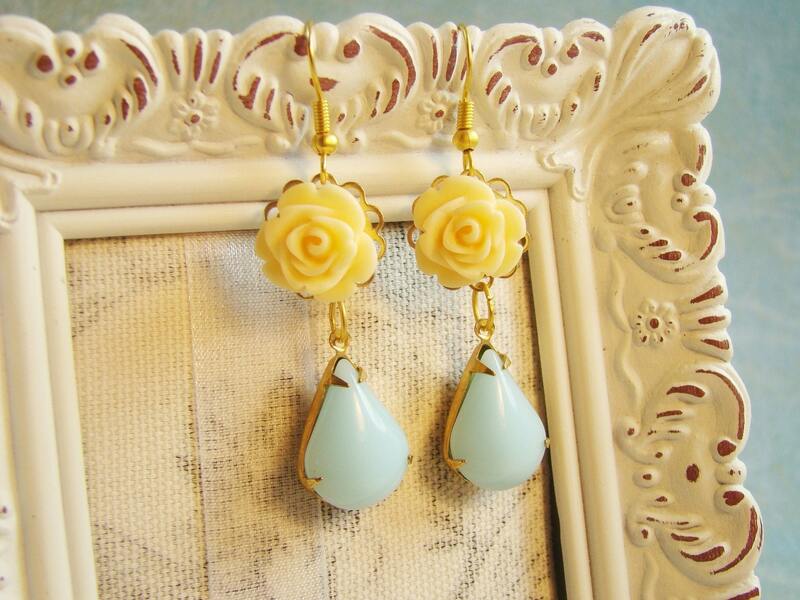 Soft & sweet, handcrafted Spring Garden inspired earrings created with Vanilla Cream Rose Cabochons & Vintage Sky Pastel Blue Teardrop Jewels in opaque milk glass set in brass pear shaped settings. Each precious little detailed rose is set on a shiny brass lace setting from which dangles the large vintage glass pear shaped rhinestone glass jewels. French ear wires are 14K gold plate, settings for vintage rhinestone and rose are shiny brass. 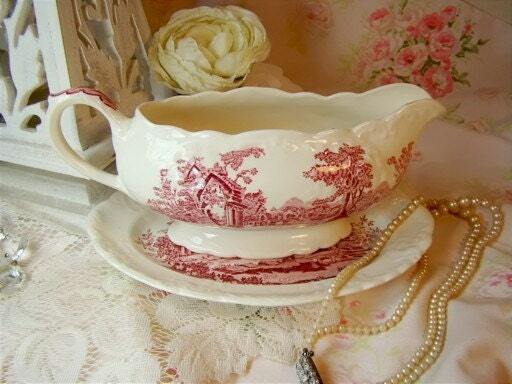 Wonderfully Shabby Chic Red Transferware Gravy Boat and oval under Plate set. English Abbey pattern by T S and T or Taylor, Smith and Taylor, USA in the 1920-1930s, and features an English landscape design with abbey ruins taken from a much older English design. The embossed plate measures 7 1/5” across, gravy boat measures 9” from tip of spout to end of handle. Both pieces have no crazying or cracks, but both have small chips, the gravy boat chip is on the spout and the chip on the platter in on the underside.